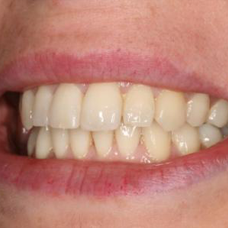 6 Month Smile braces combine proven orthodontic techniques with modern materials. They use clear plastic brackets and tooth-coloured wires to gently straighten your teeth into position, taking an average of just six months to achieve the desired result. Compare this to as much as 2-3 years for traditional braces! You could achieve your perfect smile in the time between your regular check-up visits! 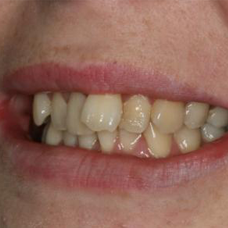 6 Month Smile braces are unobtrusive as well as fast-acting. Though not as invisible as our clear aligner teeth brace systems, the discreet bracket and wire system ensures most people won’t be able to tell you’re wearing braces at all. A special, tooth-coloured nickel-titanium wire gently moves the teeth into position. Because it isn’t trying to alter the way your teeth bite, it focuses on moving the teeth which form the smile. This leads to much shorter treatment times than traditional teeth braces.